We took off for West Texas a week or so ago seeking solitude and clearing of our minds. We were looking for time to just be together while drinking good coffee and warming in front of crackling fireplaces. The sun on our shoulders in the afternoons and bare feet in sandals after the winter was a nice bonus. Personally, I was hoping for the viewing of gorgeous quiet sunrises and sunsets. God did not disappoint. Finding peace and quiet and down time is so important. Putting some distance in between the craziness and concerns in our lives and stepping back to breathe deeply is healing. Time to focus on Who calms our hearts and gives meaning in a world that screams chaos is mandatory. I want to have that margin in my everyday life. Trying to find the quiet and balance in our day to day schedules is a challenge, but a must. I need to open my eyes and notice every day that our own front yard sunsets are pretty fantastic. That might be a start. And I will pray for you. This prayer. What if we all diligently prayed this prayer for one another? This would be a world changing prayer. "I pray that you will be blessed by God that whenever you speak that He will give you the words to lovingly and fearlessly make known the mystery and hope of the gospel of Jesus." What a prayer. Really, what if we did? Just a thought that came to mind this morning. You are documenting hope for future generations when you write down your Jesus thoughts and life experiences and scriptures that are dear to your heart. I have already had one of our boys ask about wanting to have his grandmother's bible someday. 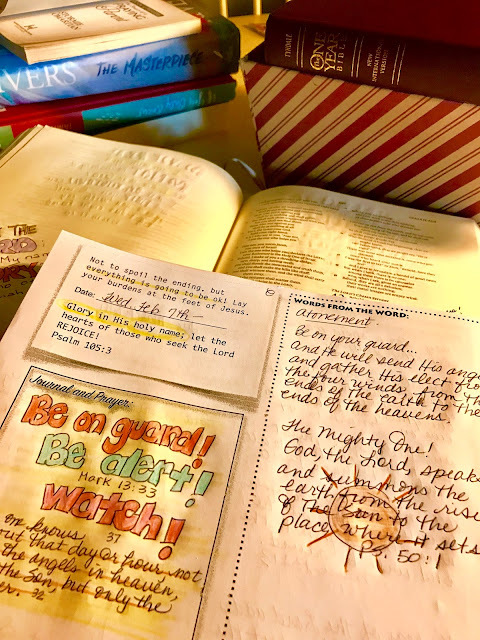 I pray that there will be a day that our children will treasure the bible I read from because it will have drawings and words written down that meant something to me and that helped me live the life God called me to. I believe that the scriptures that we write down and journal will be invaluable to our children in the future. They will be a great witness to what we felt life was about and a timetable of living for God and for His Kingdom. Good morning! I have been making this scrumptious granola for several years. 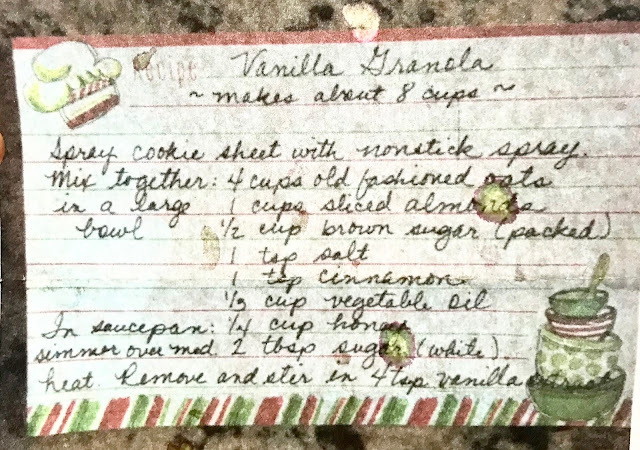 It is my sister in law's recipe and so many people have asked for it that I thought I would post on here and direct people to the blog to copy. Beware though...this stuff is quite addicting. My sweet sister Jan...the master cook, wise nurse, camp secretary that holds all things CBH together, exemplary mama, etc. I love her. You can see how "loved" this recipe has been. :) I hope that you can read it cause today there is no time to type it out. Sorry!! You have to work hard to see the recipe to gain the mouth watering goodness. Ha! Or, something like that. I need to make a batch of it for comfort food today as I pull out all of our tax papers to start working on them. Oh happy day. Not. So, there you go! Enjoy! The verse I read today from the daily Bible reading was this: Jesus gave us His life to save our lives. We also witnessed new life coming into the world this week. Sweet Saylor was born early Wed. morning. We are thrilled with the addition of another precious granddaughter. There is a sweet God story that we were blessed to witness that night. Our daughter in love was having pretty good contractions but not regular and the nurse was saying that she would have to go home from the hospital and wait it out there because she was not dilating quickly enough. She was concerned at how she would know when to come back and was already in a lot of pain. So, our son laid his hands on her and the baby and prayed that God would please speed this up and make more happen because we felt she absolutely did not need to go back home at this point.